The Maryland Chapter of the American Concrete Institute recently announced its 2014 Excellence in Concrete awards. Chaney Enterprises was proud to receive this industry recognition, along with our partners on two projects this year: MD 595 ramp overlays and the SMECO headquarters Decorative concrete floors. The ramps at the exchange between MD 595, routes 301, 3 and 50 had become a menacing and bumpy ride for the thousands of Marylanders that rode the ramps each day. The Maryland State Highway Administration specified a 6 inch concrete overlay of the existing asphalt. Chaney Enterprises worked with Concrete General on this paving project. At 1.3 miles of total paving, this was the largest concrete overlay of asphalt in Maryland’s history. 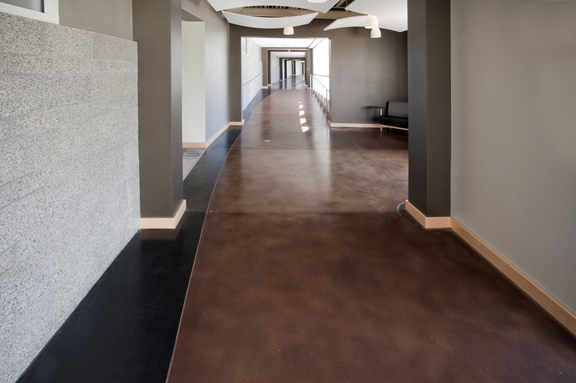 The Southern Maryland Electric Cooperative (SMECO) was looking for a vibrant floor that complemented the environmentally-friendly feeling of their new LEED certified building in Hughesville, Maryland. The solution was provided by one of our Decorative concrete customers, Hyde Concrete. Hyde ground the entire surface, taped, cut and stained the floor to award winning perfection.